Some people will be surprised to read this; after all, didn’t the importation of convicts into New South Wales, where the great majority were sent, end much earlier? Yes, the practice on the east coast ended in 1850, but it began in the west that same year after the Colony of Western Australia (WA) was officially converted to a penal colony and the first boatload of convicts arrived at Fremantle on the Scindian. Between 1850 and 1868, more than 9,600 convicts were transported to ‘the western third’ on 43 convict ships. Convictism posed a threat to free labour and there was considerable pressure exerted for its abolition in the Australian colonies and in Britain. At a time when the inhabitants of the colonies were demanding and attaining greater self-government and representation, it was an obstacle to democratic development. Self-government was achieved in New South Wales and Victoria in 1856. Anti-transportation groups, formed in the late 1840s, fought effectively against the convict system with the support of newspaper editors, wage workers and religious figures, but in isolated WA the colonial authorities saw convict labour as necessary for economic growth. The last convict ship arrived in Fremantle on 9 January 1868 with 388 men and women, of whom 280 were convicts, all men. The remainder were nearly all ‘pensioner guards’, English military personnel who served on convict ships in return for land grants, and their wives. The Hougoumont’s arrival was controversial, not the least because there were 62 political prisoners on board and, under an agreement between the British government and the colony’s governor, no political prisoners were meant to be sent out. A docile labour force was required, not potentially disruptive rebels. The political convicts were Irish Fenians, part of the transatlantic Irish Republican Brotherhood. Sixteen were ‘military Fenians’ who had taken up arms against the British. The transportees to WA were generally first offenders serving the final years of sentence, and were soon pardoned (except for the ‘military Fenians’). The Fenians on the Hougoumont included some highly literate men who left written accounts of the voyage and life in the settlement. Thomas McCarthy Fennell’s Voyage of the Hougoumont and life at Fremantle and Denis Cashman’s Fenian Diary have both been published. John Boyle O’Reilly was a remarkable Fenian, poet and writer. He escaped the colony in 1869, making his way to America on various vessels over a nine month period. He was greeted as a hero by the Irish in America. His novel Moondyne, published by George Robertson in Melbourne in 1880 (and reprinted in 2003 by Sydney University Press), was based on his convict experiences. It was produced as an early Australian silent film of the same name in 1913. On the three month voyage of the Hougoumont itself, the Fenians published their own hand-written newspaper, The Wild Goose. Only one copy was published per edition and thankfully all seven copies are held by the State Library of New South Wales. The title was named in memory of the ‘Wild Geese’, Irishmen who served in European military forces. Some of the Fenians, including Fennell, migrated to the United States after being pardoned where they continued their Irish republican activism. In 1876, they devised a plan to liberate six of their Hougoumont comrades who were still in penal servitude by sending a cargo boat, the Catalpa, to WA. Fennell and O’Reilly’s inside knowledge of the colony’s prison system and geographic environment was decisive in the successful outcome of the daring plot. 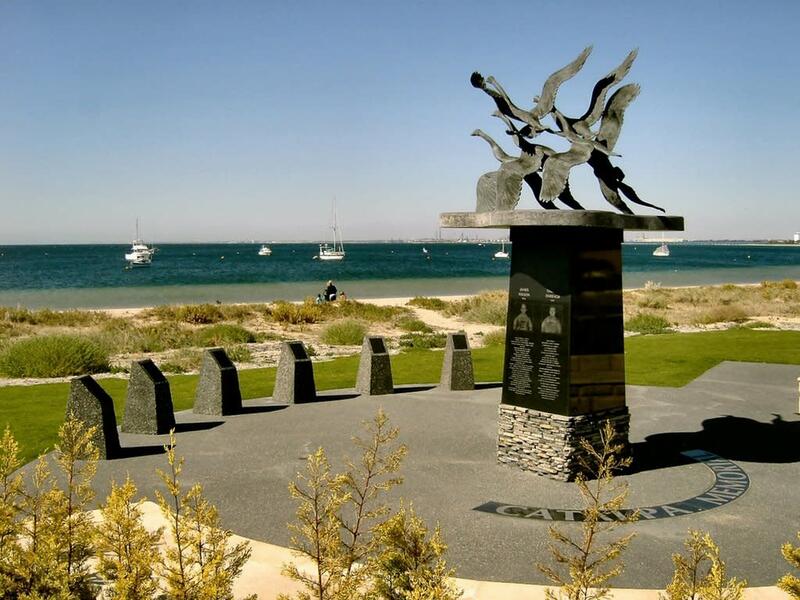 The Catalpa rescue is commemorated with a monument at Rockingham, south of Perth. The memorial has a beautiful design, featuring six wild geese in flight. With the cessation of convict transportation, WA moved on to establish a (partly) elected Legislative Council in 1870. Responsible self-government was granted in 1890. WA was the last of the colonies to end convict transportation and the last to attain self-government. About 162,000 convicts were transported to Australia, mostly New South Wales, between 1788 and 1868 on more than 800 ships. About 20 percent were women. The great majority were from England and Wales. About a quarter were Irish. They were a vital labour source for government authorities, farmers and business people. However, by 1868, the Australian colonies’ combined population was close to a million. There was no need for convict labour, even in the west. The convict heritage is closer than many realize, with the last transported convict, Samuel Speed, dying in Perth in 1938. He had been transported to WA in 1864. Once upon a time, Australians were embarrassed to have a convict ancestor in their family history. Today however, it is seen differently and, depending on the crime, generally positively; an indicator, I like to think, of a democratic ethos.